Are you worrying about the wrong bees? Your plants could be poisoning bees instead of helping them. Scottish study tells of effects of neonicotinoid exposure on brains of bees. Presidential Memorandum on saving bees. BEAN -- the Biodiversity Education and Awareness Network funded the purchase of the plants for the first Pollinator patch. TD Friends of the Environment Foundation assisted with the first printing of the guide. 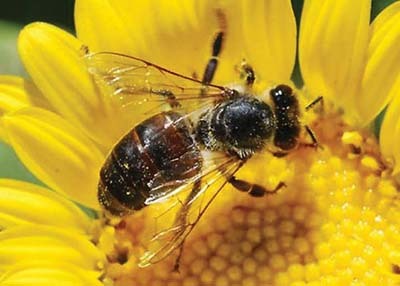 Roadsides is a program that encourages you to create habitat for native bees and other pollinators along roadsides, on cloverleafs, on unused urban land and in your garden. 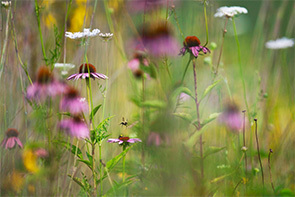 The little habitats created by volunteers like you are called Pollinator Patches. Our native bees need our help. Pollinators are in trouble -- not only the European Honey bees but our native bees as well. Their troubles begin with pests and diseases, continue with habitat loss and are finally topped by our use of pesticides such as Neonicotinoids. You and I can improve the situation by creating pollinator patches in our communities. And for goodness sakes, rethink your lawn. An interesting site from National Geographic that gives you 9 ways to help bees. Click on the picture below to go to the site. Also see a video of native bees in a school ground. The children have named them "Tickle Bees."